Drilling down on how to invest in the oil market. The global oil market is gargantuan in size. Each day, the oil industry pumps more than 98 million barrels of crude out of the ground. With the price of a barrel currently around $70, it puts the value of global oil trade at a stunning $2.5 trillion per year. For perspective, that's bigger than all the raw metal markets combined, and is more than 10 times the size of the gold market. Given the size and importance of the oil market to the global economy, it's one that investors need to understand. That's easier said than done considering the oil market's volatility and complexity, which can cause investors to lose money very quickly. It also doesn't help that investors have myriad options to choose from including oil futures contracts, mutual funds, exchange-traded funds (ETFs), as well as oil and gas stocks. To make the oil market easier to understand, we'll break it down into bite-sized pieces. People have been using oil for more than 4,000 years. Asphalt, which is a thick, sticky form of oil, was used to build the walls and towers of ancient Babylon (modern-day Iraq). Meanwhile, the Persians (modern-day Iran) used petroleum for lighting and medicinal purposes. The Chinese have also been using oil for thousands of years and drilled the earliest-known wells nearly 2,000 years ago using bamboo poles to tap shallow oil reservoirs about 800 feet below the surface. The modern oil industry got its start in 1859 when Edwin Drake completed the first commercially drilled oil well near Titusville, Pennsylvania, using a steam engine. While others drilled wells before Drake, his ignited a drilling boom, driven by demand for kerosene and oil lamps. Demand for oil continued growing as people discovered more uses, and has escalated since the internal combustion engine came on the scene. In 2018, analysts from the International Energy Agency (IEA) expect global oil demand to average 99.2 million barrels per day. The United States will consume about 20% of that oil, using 70% as a transportation fuel. Meanwhile, industrial uses such as petrochemicals and plastics will account for another 24% of U.S. oil demand while residential and commercial usage such as heating should consume roughly 5% and the final 1% will be used to generate electricity. Those percentages differ by country, though the bulk of the world's oil -- 58% -- gets refined into transportation fuels. The relationship between oil supply and global demand plays a significant role in the oil market and is a crucial factor driving the price of a barrel of oil. When supplies match demand, oil prices typically stay above production costs so that producers can make a profit. However, when market fundamentals are no longer in balance, it can have a significant impact on pricing. In 2016, for example, oil producers around the globe produced an average of 95.8 million BPD, which was more than the market needed since demand averaged of 95.4 million BPD. Because supplies outpaced demand, crude piled up in storage facilities around the world, which put downward pressure on oil prices in 2016 causing them to fall below $30 a barrel. That level was below the breakeven point for many oil producers, which began losing money, putting significant pressure on their stock prices. In 2018, on the other hand, global oil production has averaged about 98 million BPD, which is currently below demand of around 99.1 million BPD because members of OPEC as well as some other major producing counties are holding back supplies to help drain off the inventory buildup from a few years ago. Consequently, crude prices have recovered well into the $70s, which is enabling many oil companies to produce large profits, causing their stock prices to rebound. The key factor for investors to understand is that the oil industry thrives when supplies roughly match demand. That keeps crude prices high enough so that producers can generate sufficient profitability to invest in the wells needed to offset the decline from legacy wells. On top of that, they need to drill new ones to meet steadily growing demand. Oil has many prices depending on the location and type. The most well-known oil price is Brent, which is crude produced out of the North Sea and serves as a major global benchmark. Another important oil price is West Texas Intermediate, WTI, which as the name suggests, is oil produced in Western Texas. Other common varieties of crude are Western Canadian Select (WCS) from Canada's oil sands region and the OPEC Reference Basket, which is a blend of several types of oil produced by OPEC countries. Oil trades at different prices due to refinability as well as regional issues. Earlier in 2018, WCS sold for $25 less than a barrel of WTI because of pipeline problems and the fact that this heavier blend was harder to refine. In the meantime, WTI has traded as much as $10 below Brent in recent years because there isn't enough infrastructure to get U.S. oil to global markets. Because oil prices can differ significantly, oil producers in some regions make less money than others. That difference is something investors need to keep in mind if they invest directly in the stock of an oil producer. No discussion on the oil market would be complete without mentioning OPEC, which is an intergovernmental organization currently made up of 14 oil-producing nations that work together to coordinate and unify their oil policies. Those counties combine to produce about 40% of global oil supplies, which gives OPEC lots of sway over the oil market. The organization has used this power countless times over its nearly 60-year history. In late 2014, for example, OPEC chose not to intervene in an oil market that was quickly becoming oversupplied due to rapidly rising output from the U.S. as a result of an uptick in shale drilling. Instead, it wanted to maintain its roughly 40% share of the global oil market by letting prices fall and forcing higher-cost producers to cut back on new wells. More recently, however, OPEC has turned its focus back on supporting a more balanced oil market by working with several nonmember nations including Russia in a coordinated effort to cap production below demand so that the market could burn off some of the excess supply sitting in storage. That agreement has helped significantly lift the price of oil over the past year. A crucial understanding for investors is that OPEC controls a meaningful portion of global oil production. That makes it a force in the oil market, which is why investors need to keep an eye on its movements since they can impact oil stock prices. Like many other commodities, there are several ways to invest in the oil market. While it's possible to buy a barrel of oil just like an investor can buy a bar of gold or a piece of jewelry, that's not the most practical option. Because of that, most investors who want direct exposure to the price of oil will buy futures contracts or an ETF that invests in oil futures like United States Oil (NYSEMKT:USO), which buys futures on WTI. 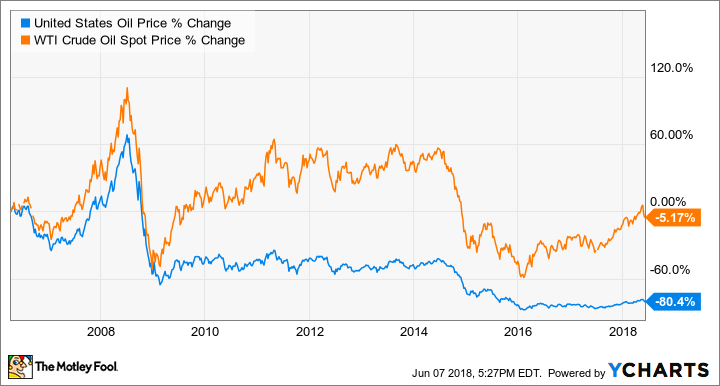 However, due to trading costs and other issues like contango and backwardation -- the former being the cost of storage and insurance while the latter has to do with future pricing concerns -- the U.S. Oil ETF has dramatically underperformed the price of oil over the long term. Thus, investors should only consider using the United States Oil ETF if they strongly believe the price of oil will move sharply in the near term. Investors also have the option of buying ETFs and mutual funds that own oil-related stocks as well as the stocks of individual companies. Before an investor goes in that direction, though, it's important that they know more about how companies fit in the oil market value chain, which is a group of linked companies working together to meet the needs of a market. In the oil industry, there are three main links in the chain: upstream, midstream, and downstream. What is the upstream oil and gas industry? Oil drilling techniques have changed dramatically over the years. While people dug the first oil wells by hand with bamboo poles, today the industry uses ultra-modern rigs that can quickly drill miles down into the ground, turn the wellbore 90 degrees, and then drill several more miles horizontally to land a well precisely in the most oil-rich spot within a rock formation. This drilling process is part of the upstream segment of the oil industry that consists of oil production companies that operate the wells and a myriad of oil-field service and equipment companies that help take them from concept to production. Oil production companies come in all sizes, from a small "mom-and-pop" producer with just a handful of wells to a state-owned behemoth like Saudi Aramco, which is the national oil company of Saudi Arabia and the largest oil producer in the world at 10.2 million BPD, or more than 10% of the global total. However, for investors, oil companies can be broken down into two main categories: independent exploration and production (E&P) companies and integrated oil companies. The difference is that E&Ps mainly operate upstream (and therefore make their money by producing oil) while integrated companies also participate in the midstream and downstream sectors (providing greater diversification and exposure to more of the oil industry's value chain). ConocoPhillips (NYSE:COP) is the largest independent E&P in the world after it spun off its midstream and downstream assets into Phillips 66 (NYSE:PSX) in 2012. In 2017, ConocoPhillips produced 1.4 million barrels of oil equivalent (BOE) per day from 17 different countries. Since ConocoPhillips makes most of its money producing oil, investors who buy its stock have direct exposure to the price of crude. In other words, when oil prices go up, ConocoPhillips' profits and stock price should follow. ExxonMobil (NYSE:XOM), meanwhile, is the largest publicly traded integrated oil company in the world. Not only is it a large oil producer at roughly 4 million BOE per day, but it's a major refiner and petrochemical producer. Those latter two activities consume oil, which helps offset some of the volatility that oil price fluctuations can have on profits. So, ExxonMobil tends to generate steadier earnings and cash flow, making it a less risky investment option than most E&Ps. Oil producers rely on a variety of outside service companies to assist them in all aspects of exploration and production. Schlumberger (NYSE:SLB) is the world's largest oil-field service company and provides a compressive suite of products and services to help E&P companies find, drill, and produce oil. Many smaller service companies focus on niche markets such as owning and operating the drilling rigs or supplying the materials or equipment needed to drill and produce oil. Overall, the global oil-field service industry pulls in more than $100 billion in revenue each year by providing support to oil producers, giving investors a wide variety of opportunities to invest in the production of oil without buying the stock of an oil producer. What is the midstream industry? Once an oil well comes on line, the production needs to get to end markets. But it's not as simple as hooking the well up to a pipeline and calling it a day. There's a complex value chain of midstream assets needed to maximize the value of every barrel of crude that comes out of the ground. This process starts with gathering pipelines, which transports a well's production to central processing locations that separate oil, natural gas, natural gas liquids (NGLs), and water. The oil then moves by truck, pipeline, or tanker to storage facilities while it waits to go through a refinery or petrochemical complex and get turned into fuel, chemicals, or another oil-based product. While oil companies tend to own some of these midstream assets, especially gathering lines and processing facilities, third parties hold a significant portion of the energy infrastructure in North America. These companies often charge fees for the logistical services provided to oil companies. Master limited partnerships (MLPs) are a noteworthy owner of these assets in the U.S. and most commonly found in the energy midstream sector. MLPs are tax-advantaged entities that pass through most of their income to investors. The largest MLP by enterprise value is Enterprise Products Partners (NYSE:EPD), while other notable ones include Magellan Midstream Partners (NYSE:MMP) and MPLX (NYSE:MPLX). Because midstream companies charge fees for their services, they tend to have limited direct exposure to commodity prices and therefore generate more stable cash flow compared to companies in the upstream sector. That often makes them better options for investors who want some exposure to the oil market but with less volatility. Another benefit of midstream companies, especially MLPs, is that they tend to pay high-yielding dividends. For example, Enterprise Products Partners, MPLX, and Magellan Midstream Partners all yield more than 5%. What is the downstream industry? The final leg of oil's journey from a reservoir to an end-user is the downstream sector. This segment of the oil industry transforms raw oil into refined petroleum products such as gasoline, jet fuel, diesel, heating oil as well as other products like lubricants, waxes, and petrochemicals. In addition to the refineries and petrochemical plants, the downstream industry also consists of marketing and distribution assets such as tanker trucks and gas stations. Like the other segments of the oil industry, investors have several options to choose from in the downstream sector, which typically makes more money when oil prices are low because they need to buy oil, which they then refine into higher-value products like gasoline. A company like Phillips 66 operates refineries, petrochemical plants, as well as marketing and distribution businesses. Meanwhile, other companies focus solely on one area of the downstream segment. For example, PBF Energy (NYSE:PBF) mainly operates refineries, Westlake Chemical (NYSE:WLK) primarily owns petrochemical plants, while Sunoco LP (NYSE:SUN) distributes refined products to places like gas stations. Investors have a multitude of oil stocks to choose from if they want to add some oil market exposure to their portfolio. They can go with an integrated oil giant like ExxonMobil and gain access to nearly the entire oil market value chain in one stock. They could also buy a couple of oil-related stocks across the value chain and make their own integrated mini-portfolio or target specific companies or subsectors of the industry. Each option requires a lot of research and has risks and reward potential. That's why investors just starting out on their journey to invest in the oil market might want to consider gaining that exposure through an oil-focused mutual fund or an oil ETF. While there are several options available, one of the top ones is the Vanguard Energy ETF (NYSEMKT:VDE). This ETF offers broad exposure to more than 140 oil stocks, though it's heavily weighted to the 10 largest oil stocks, which make up nearly 65% of the total value of its holdings. That focus on the largest oil companies across the entire value chain makes the Vanguard Energy ETF a less risky option compared to ETFs or mutual funds more heavily weighted toward E&P companies. Another benefit of the Vanguard Energy ETF is that its expense ratio is 93% less than the average of funds with similar holdings. That makes it a low-cost and lower-risk way for an investor to add some oil market exposure to their portfolio. The oil market is a complex beast that's crucial to the global economy. Because of that, oil companies invest billions of dollars each year to keep up with demand, pumping crude through their assets as it flows downstream and is transformed into useful products. That leaves investors with a nearly limitless opportunity set to potentially make money from each step of this process. While there are risks, the rewards of investing in oil can be even greater.